After 40 years of dedicated service, continuous innovation and unparalleled customer service, Rich Macleod, director of the TransFresh Corporation North America Pallet Division, will retire effective June 30, 2016, it was announced today by Ken Diveley, president and CEO, TransFresh. Macleod will be succeeded by long-time TransFresh veteran Michael Parachini and will remain available to Parachini, the Tectrol Service Network and TransFresh customers for a period of time to ensure a smooth transition. “For many years, Rich has been the guiding force behind the success of the TransFresh Pallet Division and a wide range of pioneering services and operational innovations that have enhanced the efficiency and efficacy of the Tectrol Modified Atmosphere Packaging System, offering growers and shippers a system for increased marketability of their fresh berry products and retailers a potential for greater returns on their investment,” Diveley said. 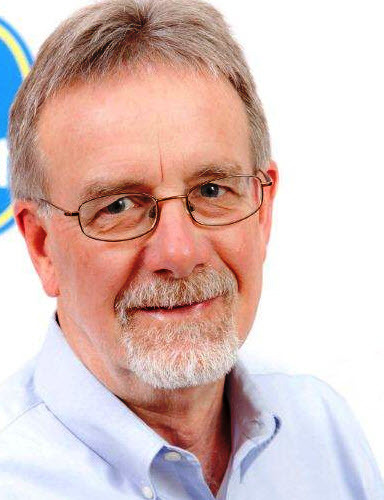 “Although we will miss Rich and wish him a rewarding retirement, I am confident that the experienced TransFresh Tectrol Service Network, under Michael’s leadership, will carry on Rich’s legacy of exceptional technical know-how and commitment to customer service without missing a beat,” Diveley said. Macleod earned his Master of Science degree in Postharvest Plant Physiology from the University of California, Davis, and worked as a research assistant in the UC Davis vegetable crops division. In 1976, he joined TransFresh Corporation as a lab assistant and rapidly became involved in evaluating the commercial relevance of Tectrol Technologies across a wide range of commodities, ultimately helping to develop a range of new applications utilizing controlled and modified atmosphere packaging. During his 40-year tenure, Macleod secured several key patents, led critical internal R&D initiatives, spearheaded proprietary research and partnered with prominent universities, federal agencies and produce trade organizations to study and quantify the economic efficacy of Tectrol Modified Atmospheres and cold chain control leading to improved retail shelf quality. Throughout the years, MacLeod has consistently maintained that any technology developed by TransFresh or the trade must have a measurable economic impact on the retail front end. Macleod served in increasingly senior positions at TransFresh until he was ultimately appointed as head of the Pallet Division in 1990. Most recently, Macleod championed his team’s successful development of the new TransFresh Tectrol Storage Solutions for Blueberries. The Storage Solution marries the Tectrol Technology with a unique zipper-sealed pallet closure system and a precision application of Apio’s patented BreatheWay® Technology to balance package permeability, resulting in stable atmospheres that are maintained over longer periods of time. Parachini, who will shortly celebrate his 27th anniversary with TransFresh, brings to his new position an illustrious history with the company. From operational and technical services management to R&D initiatives and from critical process improvements in support of customer needs to advanced equipment design and implementation, he has been deeply involved in the delivery and expansion of TransFresh and Tectrol Technologies throughout North America. 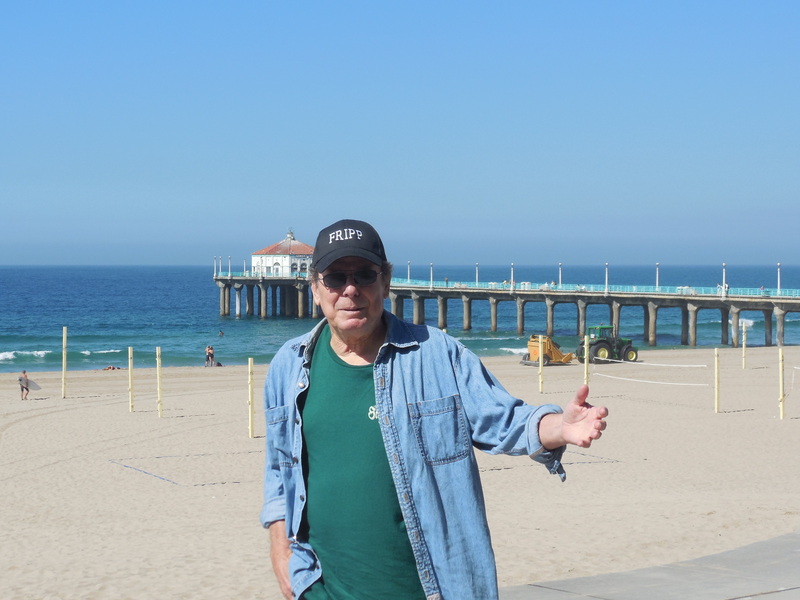 A third-generation Californian, Parachini received his Bachelor of Science degree in Agriculture Management from California Polytechnic State University. TransFresh is a pioneering and established global entity with 50 years of experience in perishables transport – recently recognized as a milestone achievement by America’s fresh produce hub, the City of Salinas, California. Tectrol® is the trademarked brand name for the TransFresh family of proprietary modified and controlled atmosphere systems and processes developed and owned by TransFresh. The Tectrol Service Network™ services, markets and supports the Tectrol® pallet and storage systems operations and technologies. Since inception, TransFresh’s innovations in packaging, equipment and sealing processes have established Tectrol® as the industry standard. The 2016 California strawberry market, evidenced by decreased acreage, an early fast pace and predicted volume resilience, bodes well for growers, shippers and retailers – especially those who protect their investment by choosing Tectrol during berry in-transit, according to Rich Macleod, director, TransFresh Corporation. The California Strawberry Commission Acreage Survey for 2016 reports that total acreage is down due to increased pressures from production costs and regulators but that despite the downward shift, volume is predicted to be resilient and consumer demand strong. “Now more than ever, growers, shippers and retailers must protect the quality of their berry products so that every pallet, tray and clamshell achieves the greatest return on investment possible,” said Macleod. The Tectrol Modified Atmosphere Packaging System is scientifically proven to significantly decrease decay during transit and on-shelf, delivering a strong level of protection beyond industry low temperature management to help ensure the quality and marketability of fresh berry products. Macleod pointed to a peer-reviewed joint research study from the University of Florida and University of California / Davis that compared cross-country shipments of California strawberries. Researchers found that strawberries transported using the sealed Tectrol pallet cover system in which CO2 levels were consistently held demonstrated a significant reduction in decay and better quality on arrival and on-shelf compared to other methods. when you consider the hundreds of thousands of strawberry pallets shipped during the season.” The TransFresh website, www.TransFresh.com, includes a calculator function that allows visitors to view the financial benefits they could realize when using Tectrol. Throughout the postharvest shipping process, TransFresh also provides full-service technical and quality assurance support and productivity management through the Tectrol Service Network. 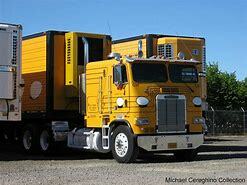 TransFresh is a pioneering and established global entity with nearly 50 years of experience in perishables transport. Tectrol® is the trademarked brand name for the TransFresh® family of proprietary modified and controlled atmosphere systems and processes developed and owned by TransFresh. The Tectrol Service Network™ services, markets and supports the Tectrol pallet and storage systems operations and technologies. Since inception, TransFresh’s innovations in packaging, equipment and sealing processes have established Tectrol as the industry standard. For more information, please visit www.transfresh.com. The study, Comparison of Pallet Cover Systems to Maintain Strawberry Fruit Quality during Transport, published in Hort Technology, August 2012, evaluated the efficacy of multiple different proprietary plastic pallet cover systems to maintain strawberry fruit quality during commercial shipment. The TransFresh Tectrol Modified Atmosphere system was one of those assessed. Non-covered pallets served as the control for the study. During the comparison, the different covers were placed over palletized California-harvested strawberries packed in vented plastic clamshells and cooled according to industry standards. CO2 was injected into the sealed Tectrol pallet bag system according to TransFresh specifications. Pallet cover systems other than Tectrol remained open at the base and without the injection of pressurized CO2 prior to shipment. Six separate shipments of palletized fruit were transported to distribution centers in either Florida or Georgia, with transit times ranging from slightly over two to almost five days. After arrival, berry clamshell samples from each treatment were retrieved and evaluated for arrival quality. Samples were then held for an added two days at 68º F. to mimic post arrival distribution, after which, quality attributes were again assessed. Researchers concluded that “transporting fruit in the sealed Tectrol pallet cover system, in which CO2 concentrations were elevated at 11 to 16 percent, was most effective as it also significantly reduced decay development during subsequent simulated retail display. In the new advertising campaign launching in key trade publications recently, Captain Tectrol will bring his unique brand of superhero powers to protect fresh strawberries in transit and on-shelf against the evils of decay as well as extend the storage clock for fresh blueberries. Captain Tectrol was first introduced almost a decade ago to offer a novel look at the features and benefits of Tectrol atmospheres and solutions. The illustrated ads were originally created for TransFresh by Full Steam Marketing and Design based in Salinas, CA and were the recipient of key marketing industry honors. In its updated iteration, Captain Tectrol finds himself in a series of story vignettes where he brings his mighty powers to protect berry quality in a variety of situations fighting various villains, including his arch nemesis, Dr. Shrink. TransFresh Puts Squeeze on Palletized Strawberries. A key to success is the advancement and modernization of equipment, whether talking long haul trucking or in this case, the machines that ready pallets with trays of strawberries, protected by the Tectrol CO2 process. Tectrol is a patented process held by TransFresh Corporation in Salinas, CA. TransFresh has what it calls a modified squeeze which effectively allows the company to increase the productivity of its conveyor system at packing facilities. Now research is being conducted to use the squeeze system in the field, according to Rich Macleod, vice president, pallet division, for TransFresh. Continuing, Macleod notes there also are programs allowing machine operators to stop and back up the pallets on the system when trouble shooting is needed. This allows the problem to be quickly addressed. In general, it (the system) is faster. So all of this is good for the produce haulers. The boxes on the pallets are more squared than ever and this reduces chances of shifting (of the load) even more. It also protects the strawberries, providing a better seal. Perhaps most important is it helps to speed loading onto the truck, reducing the wait times at the dock by the drivers,” Macleod says. In 2014 TransFresh Corporation introduced the Tectrol Storage Solution utilizing BreatheWay Technology by California produce company Apio to provide more reliable storage for fresh blueberries. While the produce trucker hauling these berries may never see the process, that driver should benefit from it. He adds the bag is dynamically different from modified atmosphere for which TransFresh has built a name with strawberries. Macleod points out blueberries after harvest are sometimes stored as long as four to six weeks as a way of balancing the market. Additionally, Macleod sees the Storage Solution as reducing the chances of quality problems at destination, which could lead to claims or deductions from the freight rate. “When the market is orderly, that’s good for everybody,” he says. Looking to the future, Macleod notes they are starting to solve the blueberry storage solutions for international transportation. If the shipper is an exporter, when those berries are loaded into a 40-f00t sea van, the product is placed in a controlled atmosphere. He also sees the day when this could be applicable for blueberries and other items being imported to by US companies from countries such as Chile and Peru. “I don’t see this replacing containers,, but it could certainly impact the number of containers used. I see them being used side by side,” he says. In the controlled atmosphere systems there is a device that records the atmosphere for the entire container. However, Macleod sees this being cost prohibitive to something like that in each pallet. However, there is research being conducted in this area. TransFresh® Corporation of Salinas, CA has announced that usage has expanded for its high velocity Tectrol® application systems, recently placed in multiple cooler locations ahead of peak Strawberry production, increasing efficiency and throughput for berries bound for US and Canadian markets. According to TransFresh, the specialized equipment systems facilitate the proficient application and sealing of poly sheeting in a seamless and reliable operation, meeting significantly higher demand for Tectrol. TransFresh and its Tectrol Modified Atmosphere Packaging systems are best known industry-wide for adding a level of protection to help ensure the quality and marketability of fresh berry products throughout the supply chain. Every step of the Tectrol process is happening simultaneously with the high velocity systems: gripping and lifting pallet cartons to apply bottom sheeting, installing and sealing bags and adding beneficial atmospheres to immediately trigger the slowing of senescence. Macleod further stated that the continuing strong interest in Tectrol Modified Atmosphere Packaging systems was spurred by a comprehensive research initiative conducted by two leading academic postharvest departments under the US Department of Agriculture Specialty Crops Project with the mission to increase the consumption of specialty crops, such as strawberries, through enhanced quality and safety. Under the project, teams from the University of California at Davis and the University of Florida jointly evaluated the efficacy of pallet cover systems to maintain strawberry fruit quality during commercial shipment. Findings concluded that “transporting strawberries in the sealed TransFresh Tectrol pallet cover system in which CO2 concentrations were elevated at consistent levels was most effective in complementing low temperature management practices to reduce decay and maintain fruit quality.” The research, Comparison of Pallet Cover Systems to Maintain Strawberry Fruit Quality during Transit (HortTechnology, Aug. 2012), also concluded that after a two-day shelf life, fruit from the Tectrol pallets achieved “significantly less decay” than other systems evaluated. Macleod concluded that the development and installation of the high performance equipment system at these multiple cooling locations is the result of TransFresh’s commitment to support the berry trade as a whole by fulfilling its fundamental mission to protect berry quality. TransFresh is a pioneering and established global entity with nearly 50 years of experience in perishables transport. Tectrol® is the trademarked brand name for the TransFresh® family of proprietary modified and controlled atmosphere systems and processes developed and owned by TransFresh. The Tectrol Service Network™ services, markets and supports the Tectrol pallet systems operations and technologies. Since inception, TransFresh’s innovations in packaging, equipment and sealing processes have established Tectrol as an industry standard. For more information, visit www.transfresh.com. 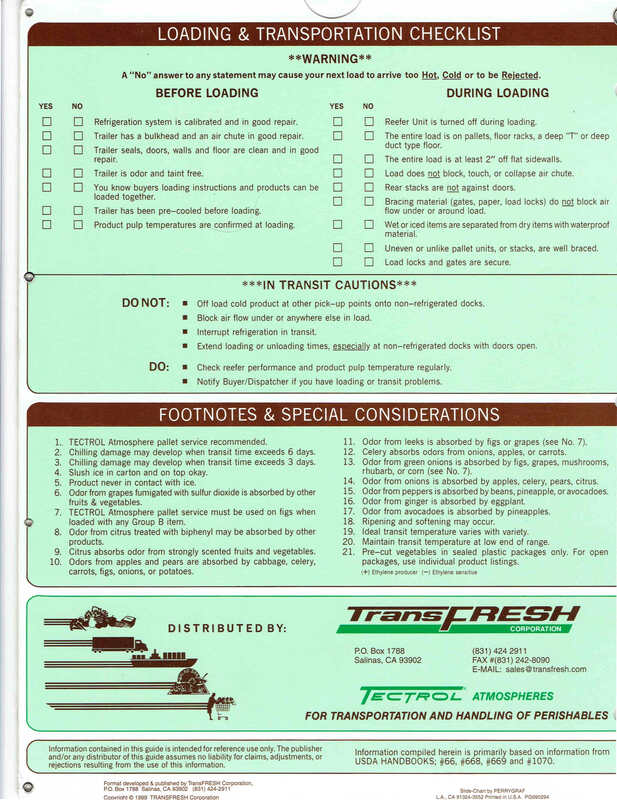 It has been nearly three decades since TransFresh Corporation’s Rich Macleod created the Fresh Produce Mixer & Loading Guide and he still receives requests for 100 or more of the guides each year. The guide continues to be a useful tool in preventing the transporting of incompatible fruits and vegetables, which can result in the loss of product quality, and even lead to claims or rejected loads. However, despite all of the information available on the topic, problems with arrivals of product at destination due to incompatibility of the produce on board still occurs. “They (shippers) know if there is a load that is 90 percent head lettuce and there is a pallet of apples in the trailer, that is not good,” Macleod says. But sometimes chances are taken with incompatible items, especially if the transit time is not very long. “The sensitivity of what does and doesn’t go on a load has really improved in the last five years,” Macleod notes. 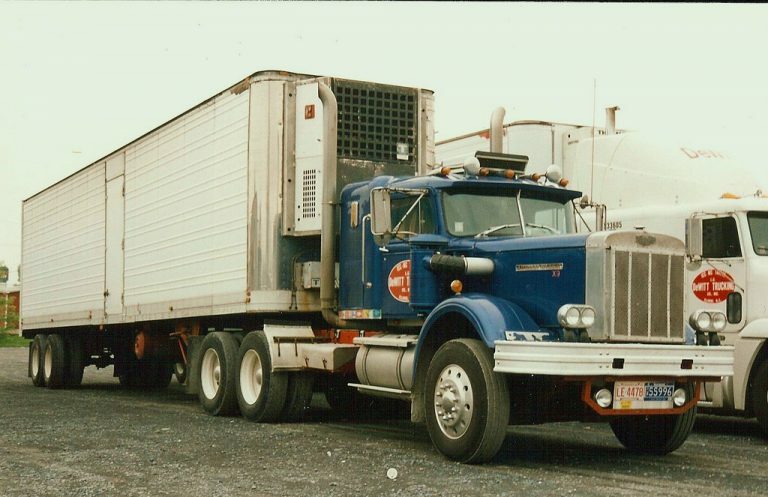 He adds there are more larger carriers hauling produce and they are becoming more sophisticated with what to put in the trailer on mixed loads. He laments there seems to be fewer independent owner operator than in the past doing long haul trucking. Macleod sees more shippers using their own brand on many fruits and vegetables, and they have become more particular how these products are loaded and transported because their name or brand is on the box. 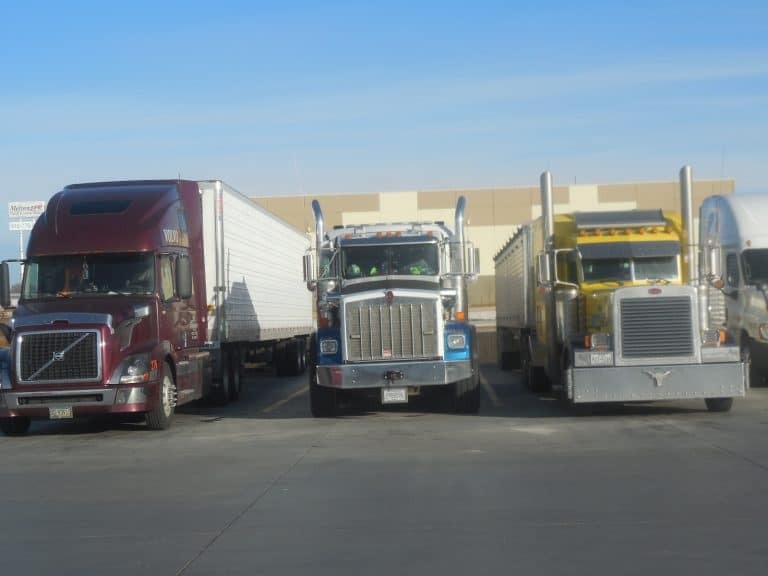 He points out when a produce hauler picks up product in a warmer climate, there usually is a lot of activity, because a lot of produce is being moved. This increases the chance the product may not have been pre-cooled. While Macleod does not see this as a huge problems, he notes it still does happen. “The primary protection for the driver (and receiver) is they know the pulp temperature of the product going into the trailer,” Macleod says. Since Macleod works a lot with strawberry shipments, particularly through TransFresh’s Techtrol program, he is seeing less resistance to the driver being provided pulp temperature information on product just being load. He isn’t sure if it is a major problem with other produce commodities. Even if the driver did not observe the loading, he can still alert the customer (receiver) while still at the dock, if he notices the product is three to four degrees warmer than it should be.